Just a bit of a fun post for you today! 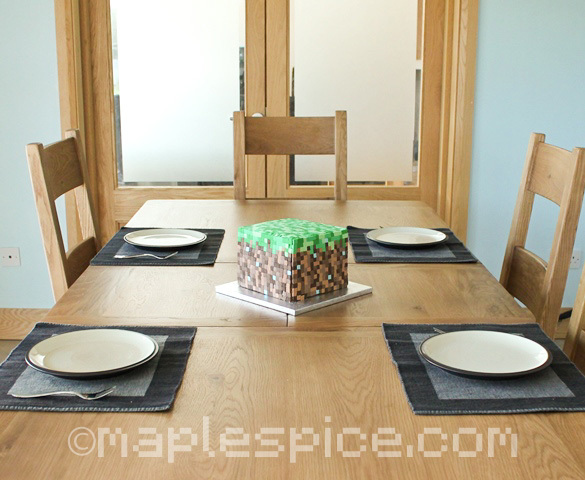 It was my son's 11th birthday yesterday and like most boys his age he is mad about minecraft. 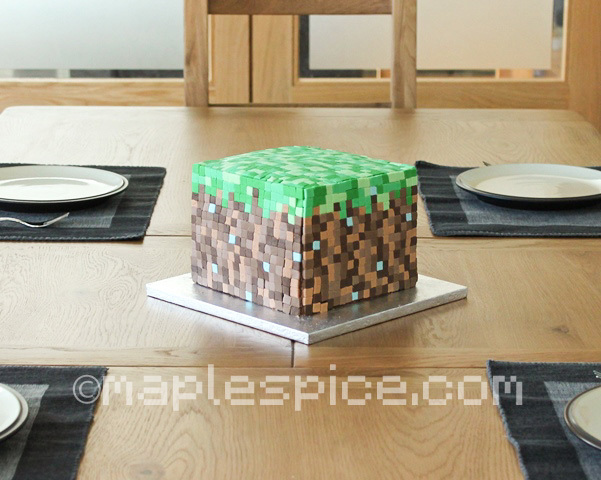 I thought about making him a themed birthday cake and had a search online and was just floored when I saw this one, looking just like the grass blocks in minecraft with around 1300 hand cut squares of fondant! 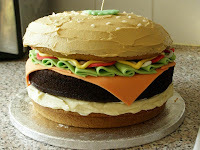 I really didn't think I would be able to make this as I've only once worked with fondant before, on the Veggie Burger Cake and let's face it, that was just cutting out rudimentary shapes and laying them down on the cake - nothing difficult. I felt this would be out of my cake decorating ability but the cake's designer, Ann Reardon of "How to Cook That" provides a fantastic video on her site on how to do it so I got brave and decided to have a go! Overall I was so pleased at how this turned out! 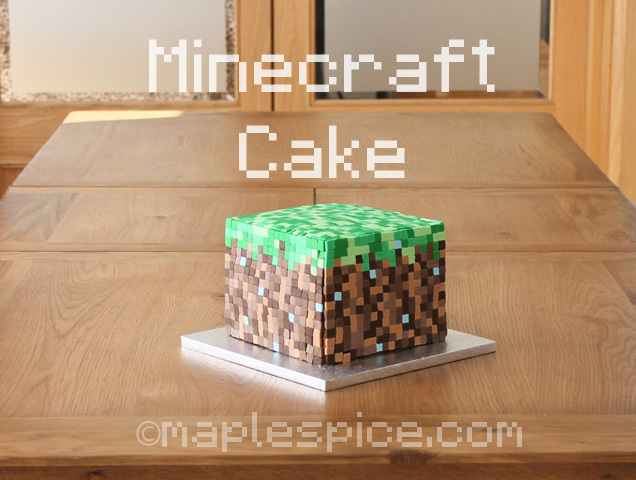 Sure, mine is a little more wonky than the more "professional" ones out there, lol, but all those little imperfections do not matter when viewing this cake from a bit of a distance. That's when it looks proper pixelated and is most effective. According to my son I got it "spot on perfect" so that's all that matters to me! I kept the whole cake a secret from him, working away on it upstairs in the guest room where our old dining room table is set up. When I finally showed it to him he was simply gobsmacked and just LOVED it - well worth the hours of decorating! 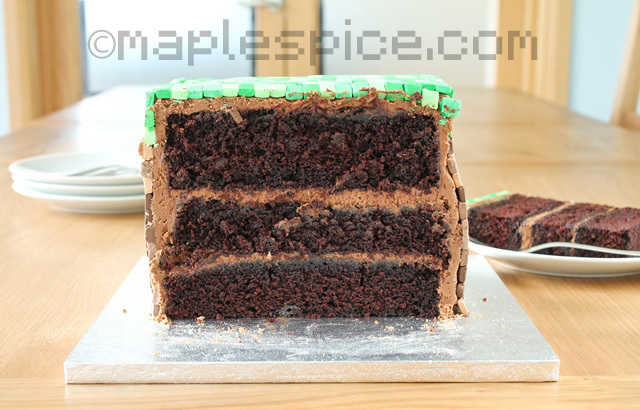 Vegan Notes: For the chocolate cake and frosting I used both recipes from my Quadruple Layer Chocolate Cake, halving the cake recipe and baking it in a 6" square cake tin, then repeating that 3 times. I also doubled the amount of frosting to ensure I had enough and it was a good call! The fondant and food colours where simply purchased from a sugarcraft shop. I made sure everything I bought was labelled suitable for vegetarians as that's always a good start in ensuring colours will be vegan (not a guarantee, just a good start!) then I checked that they would be suitable for vegans by researching all the ingredients online. I'm basically now an expert in e-numbers, ha! Can I just say WOW! Well done, and holy patience. Cake looks yummy. Haven't tried vegan baking yet. 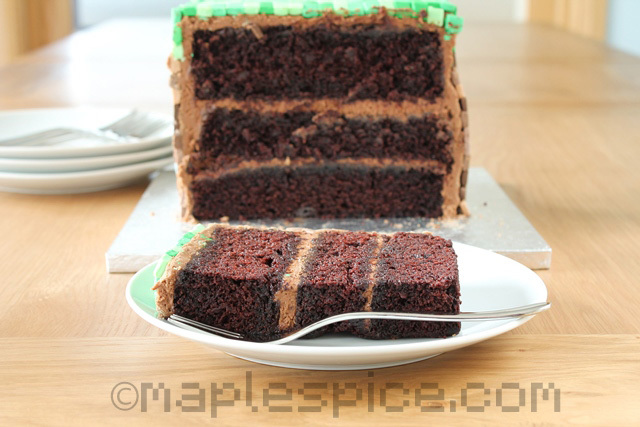 Your chocolate cake just may be the thing I need when lent is done. Yum. Adorable! My son is 10, and he loves that game. He would go nuts for this cake on his birthday!!! That looks too cool to be true!!! Amazing work! Aw, that's fantastic and something he will always remember :) Well done! [ Chuckles ] Very nice; it looks more like a decoration than something to eat!